Deep Blue Jazz Montreal: Johnny Beaudine and Deep Blue - House of Jazz - "They Call Me Big Mama"
Johnny Beaudine, saxophone player and Chicago blues and R&B veteran. Johnny Beaudine and Deep Blue - House of Jazz - "They Call Me Big Mama"
Here's a video shot during a show we did at the House of Jazz on May 3. This video features Sylvia Harris on vocals and Jeff Simons on drums as well as myself on tenor sax, Peter Mika on piano and Gary McKenzie on bass. We were doing a tribute to Big Mama Thorton, organized by Doudou Boicel of Rising Sun fame, hence the tune, "They Call Me Big Mama". 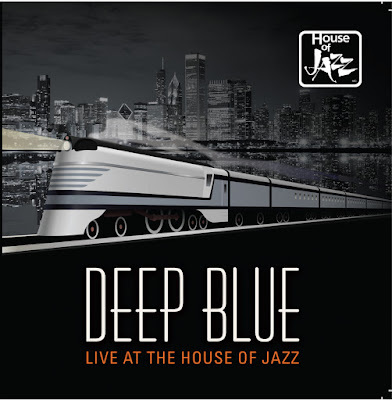 Check out "They Call Me Big Mama"
Recorded Live at the House of Jazz Montreal, Deep Blue plays Benny Golson's great hard bop tune, "Whisper Not"
Chicago native John Beaudine has played and toured with numerous blues legends including James Cotton, Willie Dixon, Junior Wells, Otis Rush, Buddy Guy and Matt “Guitar” Murphy of Blues Brothers fame as well as rock and roll hall of fame legend Bo Diddley. After migrating to Quebec, he worked with such artists as Serge Fiore (Harmonium), Dan Bigras, and Joey Tardif (Epopee Rock). Aside from his many studio hours as producer/engineer/performer, his experiences includes creating scores for numerous television shows (including the CBC's Just for Laughs series), and working as an A&R Representative for Mercury Records. He is also the co-writer (with Serge Fiori) of the score for the film “Une Histoire Inventee” directed by Andre Forcier. There's more information and photos on my Facebook Page: Johnny Beaudine. Catch up on recent events and meet our friends. Copyright Johnny Beaudine 2011. All Rights Reserved. Travel theme. Powered by Blogger.